Books are great conversations starters with young readers. Teachers, librarians or parents can use these activities while their children are reading Magic Trix. When Trix discovers she’s a witch, she is paired with Jinx – a magical companion called a familiar. Children can create their own familiars. What animal would they choose? What name would they give it? Have them draw or write a description of their new magical companion. In Magic Trix: The Witching Hour, Trix helps her best friend Holly overcome her shyness. Trix realises that helping others is its own kind of magic. Brainstorm how your young readers can help family, friends and neighbours. And if they follow Trix's lead and help someone, please send me an email and they can become an official Magic Trix fairy godmother or father in training! Send details of their good deeds to sara (at) sara-grant.com! In the first book, The Witching Hour, Trix learns how to appear and disappear. In the next book, Flying High, Trix learns to fly. Ask your young readers to select the type of magic they wish they had – flying, super strength, x-ray vision, invisibility, etc. The sillier the better -- in my opinion. Ask them to write a story about how they would use their new power to help others. 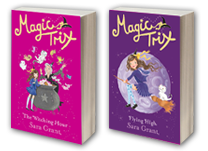 Magic Trix is suitable for readers age six years old and up. I enjoy visiting schools and libraries. I endeavour to use my series not only to inspire children to write but also encourage them to think of others and, like Trix, act as a fairy godmother by performing random acts of kindness. My interactive presentation can be tailored to tap into a teacher’s literacy, creative writing and PSHE curriculum goals. My one-hour presentation includes a discussion of how I comes up with ideas and write stories. During my interactive session, I ask students to brainstorm stories ideas and ways to act as fairy godmothers in real life by performing random acts of kindness. For more information about my events or to invite me to your school or library, please send me an email at sara (at) sara-grant.com.